t*rexes and tiaras: Sunday Shoes 056: Nike Zoom Structure Running Shoes..
Sunday Shoes 056: Nike Zoom Structure Running Shoes.. I first spotted these trainers a couple of weeks back. Their fabulous bright colour drew me in and I added them to a wishlist post. I was really pleasantly surprised when they turned up at my door a few days later and could not wait to get to the gym to try them out. Thankfully, since I go to the gym at least once per day (either for a swim before work, a Metafit, spinning or kettlebells class, or just a general gym workout) and sometimes more than once, I didn't have to wait long to give them a go. It's been a while since my last pair of new trainers and I noticed as soon as I put these ones on that they were built completely differently. Where my old ones had a really flexible sole, which I've gotten used to and rather like for gym classes and suchlike, these have a thicker and more structured sole, which was a little strange to start with. I've read a few conflicting articles about what is best for running. The only running I tend to do with any regularity is on the treadmill, which I know is a little different to running out in the open. I've worn these for the gym, treadmill and for Metafit and kettlebell classes so far and I also took them to camp with me last week in order that I could force myself to do some actual outside running (I'm hopeless) in the absence of the gym. I am not a convert to running but at least I felt as though I was doing something. I've found these running shoes really genuinely comfortable; they haven't rubbed my feet or anything and my feet don't get too hot in them, thanks to the breathable fabric of the uppers. Overall, I'm used to them now and really pleased with them. Plus, the colour freaking rocks! They are really lovely. 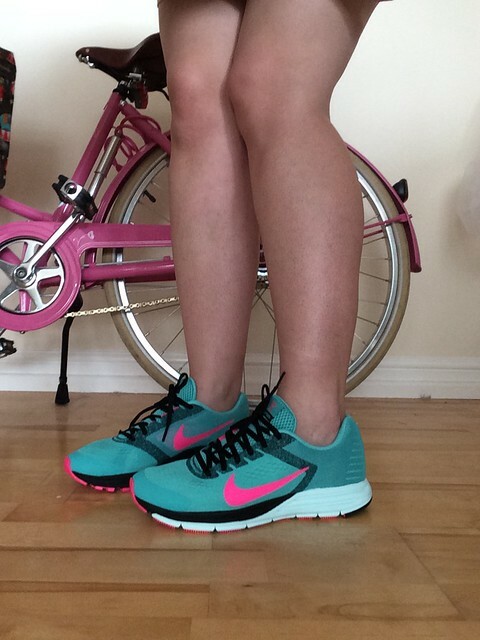 I made sure that I got trainers specifically designed for running as it's the only thing I do. Yeah, I've only recently realised how much difference things like that can make! I do find that they've sort of helped me to get inspired! Those trainers are ace, I love how bright they are! Everyone has commented on the colour when I've worn them, so far! These sound great and look great too, love the colours. I'm looking for something nice and light for running and classes and these fit the bill. Such a lovely bright colour!